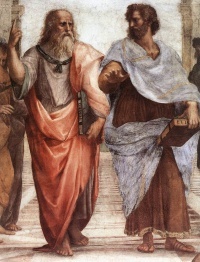 Illustration: Plato (left) and Aristotle (right), a detail of The School of Athens, a fresco by Raphael. The Western canon is a term used to denote a canon of books, and, more widely, music and art, that has been the most influential in shaping Western culture. 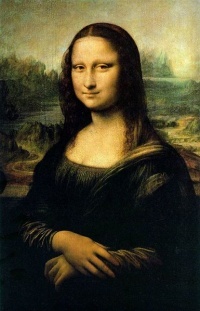 It asserts a compendium of the greatest works of artistic merit. Such a canon is important to the theory of educational perennialism and the development of high culture. Although previously held in high regard, it has been the subject of increasing contention through the latter half of the 20th century. In practice, debates, and attempts to actually define the Canon in lists, are essentially restricted to books of various sorts: Literature, including Poetry, Fiction and Drama, autobiographical writings and Letters, Philosophy and History. 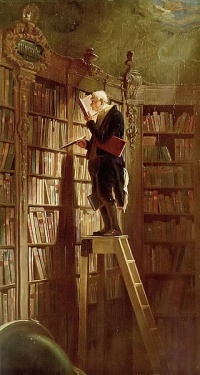 A few accessible books on the Sciences are usually included. The process of listmaking—defining the boundaries of the canon—is endless. One of the notable attempts in the English-speaking world was the Great Books of the Western World program. This program, developed in the middle third of the 20th century, grew out of the curriculum at the University of Chicago. University president Robert Hutchins and his collaborator Mortimer Adler developed a program that offered reading lists, books, and organizational strategies for reading clubs to the general public. There has been an ongoing, intensely political debate over the nature and status of the canon since at least the 1960s. In the USA, in particular, it has been attacked as a compendium of books written mainly by "dead white European males", that thus do not represent the viewpoints of many others in contemporary societies around the world. Others, notably Allan Bloom in his 1987 book The Closing of the American Mind, have disagreed strongly. Authors such as Yale Professor of Humanities Harold Bloom (no relation) have also spoken strongly in favor of the canon, and in general the canon remains as a represented idea in most institutions, though its implications continue to be debated heavily. Defenders maintain that those who undermine the canon do so out of primarily political interests, and that the measure of quality represented by the works of the canon is of an aesthetic rather than political nature. Thus, any political objections aimed at the canon are ultimately irrelevant. One of the main objections to a canon of literature is the question of authority—who should have the power to determine what works are worth reading and teaching? Works which are commonly included in the canon include works of fiction such as some epic poems, poetry, music, drama, novels, and other assorted forms of literature from the many diverse Western (and more recently non-Western) cultures. Many non-fiction works are also listed, primarily from the areas of religion, mythology, science, philosophy, economics, politics, and history. Unless indicated otherwise, the text in this article is either based on Wikipedia article "Western canon" or another language Wikipedia page thereof used under the terms of the GNU Free Documentation License; or on original research by Jahsonic and friends. See Art and Popular Culture's copyright notice. This page was last modified 14:49, 8 December 2014.